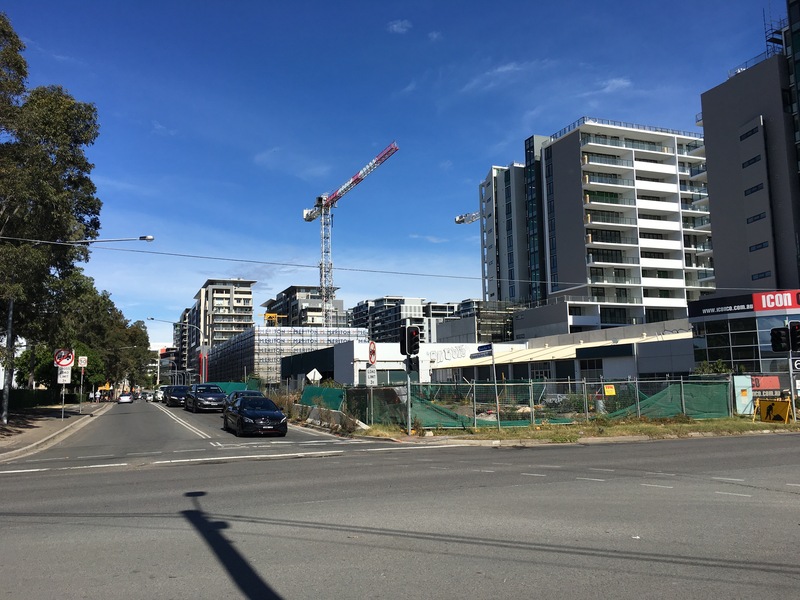 There is unquestionably a continuing housing shortage in Sydney, leading to some of the most expensive real estate in Australia and the world. It is a law of modern cities that no urban water feature should stay underdeveloped. The Alexandria Canal was built around 1900, widening Shea’s Creek, a tributary of the Cook’s River, to serve industrial activities like tanneries that lined its shore. Proposals have been floated to transform it to into a Little Venice, but these were spiked for environmental reasons, disturbing the canal would let loose toxic sediments which would contaminate other waterways. So instead it was left fallow, to wallow in its chemical filth. While that may (or may not) have been a wise decision under one set of economic cost calculations, considering the current costs of remediation, the environmental costs of doing nothing and the value of the redevelopment, conditions have changed and the decision should be revisited. Alexandria Canal, NSW looking north. Source wikipedia. The parallel Airport Rail Line opened a century later in 2000, just prior to the Sydney Olympics. It was financed under a poorly structured public-private partnership which initially levied exorbitant station access charges, that the NSW government eventually bought down for the non-airport stations. Nevertheless it has significant excess capacity which could be taken advantage of. If we assume it eventually becomes a normal line, we can think about how it might be used to promote the kind of growth that is beneficial to the public. Walking Route from Green Square to Mascot. Approximate half way point in orange oval. Alexandria Creek to the southwest. Map by Google. I walked the corridor this weekend. This Airport Rail Line cries out in pain for an additional stop halfway between Mascot and Green Square. This lands just south of Huntley Street and Bourke Road, at the northern edge of the Alexandria Canal, home today to the redeveloped Mill at Bourke Road. The distance between the rail stations at Green Square and Mascot is 2.6 km, 32 minutes walking, 3 minutes by train. Typical station spacing this close to the CBD is much shorter. Redfern to MacDonaldtown, e.g. is only 1.7 km. Given 800m is a useful threshold for walking distance to rail stations, 1.6 km (1 mile) is a natural spacing. 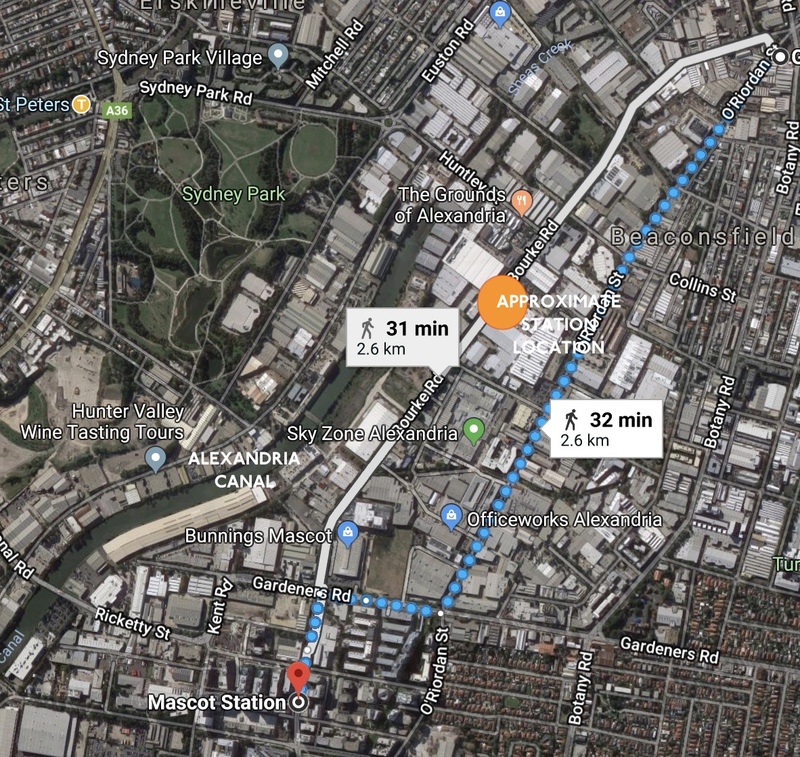 1.3km might be a bit close between stations, but it is still longer than the CBD stations (Town Hall to Central is 1.1 km). I don’t know the cost of designing and constructing a new station on this existing line, it is undoubtedly more expensive than it should be, but there is experience with infill, and it is less expensive than a new line on a per passenger basis. I would think the real estate development could cover it. The historic Mill plus a train station would make a great community centre for a new precinct, perhaps the Mill District, or the Canal Zone, which would feature more intense residential, office, and commercial development complementing, and eventually replacing, single story warehouses, auto dealerships, big box retail stores, and light industrial between Mascot and Green Square, lining the area from the canal to O’Riordan Street. Development in Mascot. Photo by author. The region is focusing on new Metro Lines while forgetting opportunities that lie immediately at hand, incremental investments in the Trains network which likely reveal benefits well in excess of costs. Mascot and Green Square will soon be built out, and new land will need to be engaged.